I’m sitting in a cafe in Dali a long way from Yiwu where we were on the second day of our Yunnan tour. The first day we were in Huangshan a good portion of the afternoon was spent at a dedication and ribbon cutting ceremony for Wang Fangsheng. 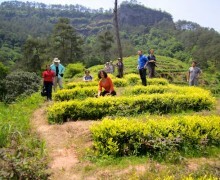 We started off this year’s green tea/wulong tea tour on a beautiful spring morning. Our first stop was the Lu Yu Tribute Tea Factory Museum. During the Tang Dynasty there were 20,000 people involved in the factory, and all of the tea produced was for the consumption of the court. Production only lasted for about a month. Huangshan is one of those places that for millennia has drawn Chinese artists. It is also a center for tea culture. The area was instrumental in the development of modern tea making techniques that developed during the Ming Dynasty. I’m behind on posting for the Green Tea Tour. Please forgive while I catch up. The tour stayed in Hangzhou for a couple of days and sent these photos back. The tea was just beginning to be harvested because of temperatures way below what is normal for this time of year. Hangzhou is the modern center of Chinese Tea Culture. Just south of HuZhou is the ancient town of Nanxun. It is a small town that is built around the canals that crisscross the area below Tai Hu. Life on these canals is prehistoric…. Our little band of travlers made it to Jiangsu Province today to visit the gardens where Bi Luo Chun is grown. Bi Luo Chun is one of the most prized Chinese green teas. The growing area is small and this tea is often faked. The real thing however is spectacular. The tour today was in Anji. Anji Bai Cha is one of the great green teas. Bai cha means white tea in Chinese but this tea is green. This tea was the favorite of the famous Song Dynasty emperor, Song Hui Zhong. Our Green Tea Tour is underway and here are some photos that Tang Le sent me last night. They are in Changxing in Zhejiang province. Changxing is just south of Tai Lake about 1.5 hours west of Shanghai.